There was a stunned silence when Christopher Paul Stelling unstrapped his guitar after his set at the Campfire Music Festival. As he walked off the stage, the grizzled sound engineer -- who was great at his job but had clearly seen it all before -- walked over and shook Stelling's hand, exclaiming that Stelling was one of the best performers he'd ever seen. That's because in the space of Stelling's short 30-minute set, he performed some of the most haunting renditions of old folk songs I'd ever seen, sang his heart out in the middle of a festival full of somewhat sanitized "folk" and "blues" musicians (see: most of the people tagged under Campfire so far -- I saved the best for last), and for a grand finale, he played an incredibly complicated finger picking pattern...while holding his guitar upside down and over his head and screaming the final verses of his last song. 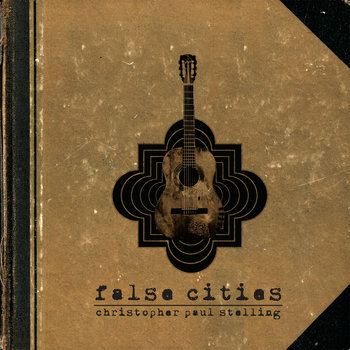 I saw Stelling a few weeks ago in Brooklyn, somewhat more subdued after a return to sobriety and playing to a mid-week crowd in Williamsburg. But his performance was still heartfelt, it still wowed the crowd, and I'm sure it made him a bunch of new fans. I'm not going to write too much about False Cities itself because its potency is evident from the first few seconds of "Brick x Brick." His performance on the recordings is exactly what you'll get from him at a live show: the joy of performing and self-expression. If anyone covered on this blog fits the tagline -- music like your life depends on it -- it's Stelling. These are songs of contemplation and catharsis, exactly what music is supposed to be for.